The people from DriveSavers really know how to make a point about data recovery. 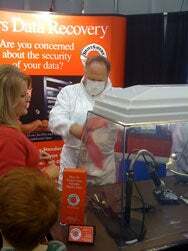 A volunteer gets ready to go medieval on a hard drive at DriveSavers’ Expo booth. Typically, the company’s area of expertise—painstakingly rescuing irreplaceable data from damaged hard drives—isn’t the sort of thing to attract an audience on a crowded trade show floor. But this week, the company pulled off what I think was one of the cooler demos at Macworld Expo. The demo begins by showing a nice slideshow of DriveSavers’ clean room facilities—get a closer look yourself in this Macworld.com profile from last summer—followed by what happens when a hard drive fails. A demonstration then follows in which “Dr. Data,” DriveSavers’ Expo MC, pulls a volunteer out of the crowd; the volunteer dons a clean suit. The Don’t Try This At Home portion of the demo then begins: instead of opening a hard drive in a clean room environment with a trained professional, the crowd watches the audience member take a dental tool to an open hard drive wheel. This simulates the damage a hard drive might receive over time. Things wrap up with DriveSavers reps explaining more about how they do what they do. You’ll never look at a hard drive quite the same way again.